Remarks: Storm Rider is a straight-up repaint of Generations Waspinator, you can find the full review there. Just some words on the differences here. 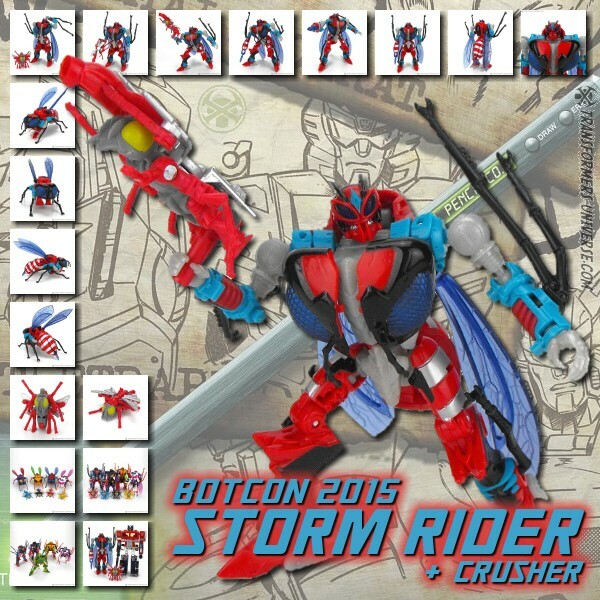 Storm Rider was repainted in red and bright blue, giving him an entirely different look than Waspinator's classic yellow and green. He wields the same stinger gun Waspinator does, but additionally he comes with Minicon Crusher. Crusher, who is a Waspinator repaint himself (from the ...), can transform from small robot to small wasp and also becomes a Targetmaster gun for Storm Rider to wield. That's pretty much it in terms of differences to Generations Waspinator. Storm Rider and his fellow Waruders were part of the Botcon 2015 attendance package and harken back to the pre-Transformers days of Diaclone. In the Diaclone toyline the Insecter Robos (who later became the G1 Insecticons) served as bad guys. The Botcon 2015 story references that by making the bigger Waruders suits of biomechanical armor and their smaller companion robots being the drivers. Storm Rider here is one of many Waruder drones, but was also repurposed in the story as King Waruder, the leader of the swarm, piloted by Daros. I wasn't originally interested in any of the 2015 Botcon toys, but when I saw the Waruder four-pack on sale for a really decent price, I couldn't resist. It helps if you are a) a fan of Beast Wars figures and b) old enough to indulge in a bit of Diaclone nostalgia here. So, basically like me. Anyway, bottom line: Storm Rider is nothing more and nothing less than a repaint of Waspinator. Good enough for me.